We can send fish to most western European destinations. Please call the office to enquire as to the feasibility of fresh fish shipments to your specific location. After the auction has finished, fish is immediately loaded on pallets from the chilled market into refrigerated reefer containers ready for the ferry journey to the Scottish mainland and beyond. The ferry leaves every night from Shetland. 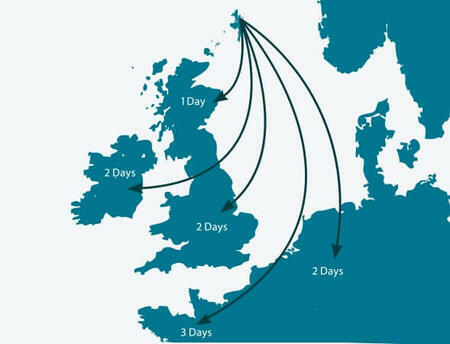 The consignment takes 12 hours to reach Aberdeen, where fish are unloaded and routed into the nationwide and continental delivery network. The cold storage chain is unbroken from ship to final destination. Despite our remote location, excellent distribution links means our fish reaches England, Ireland and Boulogne Sur Mer in 2 days and Brittany in 3 days. Our French linkage is through DFDS.